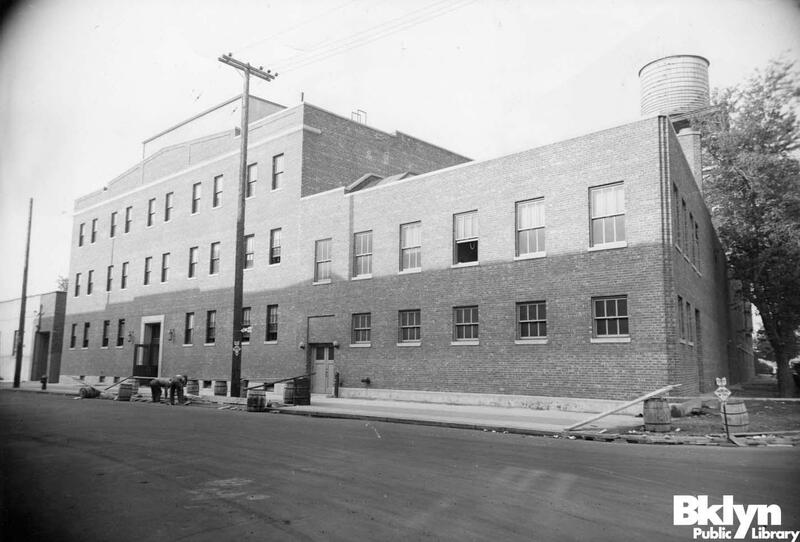 Looking south, the recently demolished Vitaphone Studios (yellow outline) in relation to many of Roscoe’s filming sites. The landmark Vitagraph smokestack, for the moment still standing, appears at bottom due right of the “North” marker. (C) 2017 Google. Starting at page 2 below, this multi-page post reveals more than two dozen Brooklyn movie locations filmed over 85 years ago. Click each image for a larger view. Arbuckle filming Hey Pop at 3rd Ave and 80th in Bay Ridge – see page 7 below. 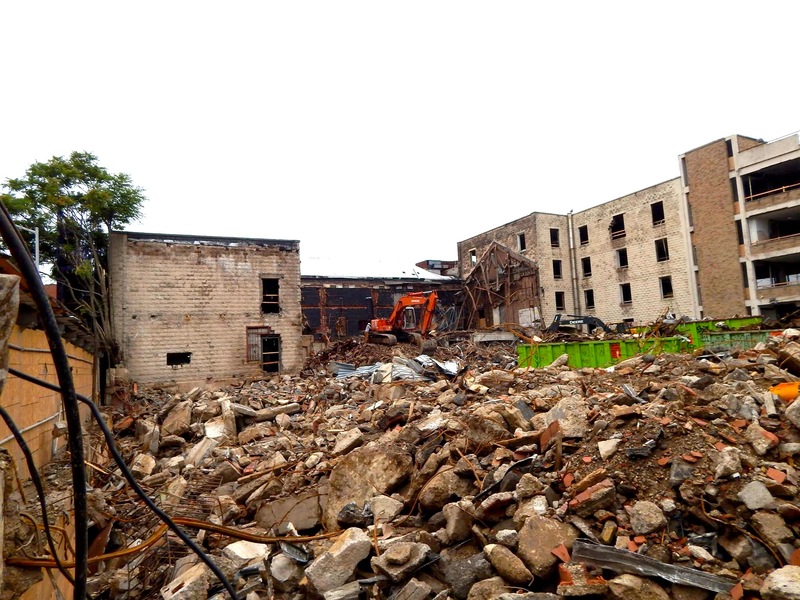 The recently demolished Vitagraph (Vitaphone) Studio, once standing at E 14th between Chestnut and Locust in the Midwood community of Brooklyn, holds a giant place in cinema history. One of the earliest and most prolific studios, it was acquired by Warner Bros. in 1925, where it became instrumental in the widespread production of talking pictures. The Vitaphone process, the first commercially viable sound film technology, involved recording audio tracks on 16 inch shellac discs that played synchronously with moving images. The smash Vitaphone presentation of Al Jolson’s The Jazz Singer in 1927 spelled the eventual doom for silent pictures. Capitalizing on local talent, the Brooklyn Vitaphone studio produced hundreds of short ‘sound’ films capturing unusual vaudeville acts, and Broadway singing stars and comedians. 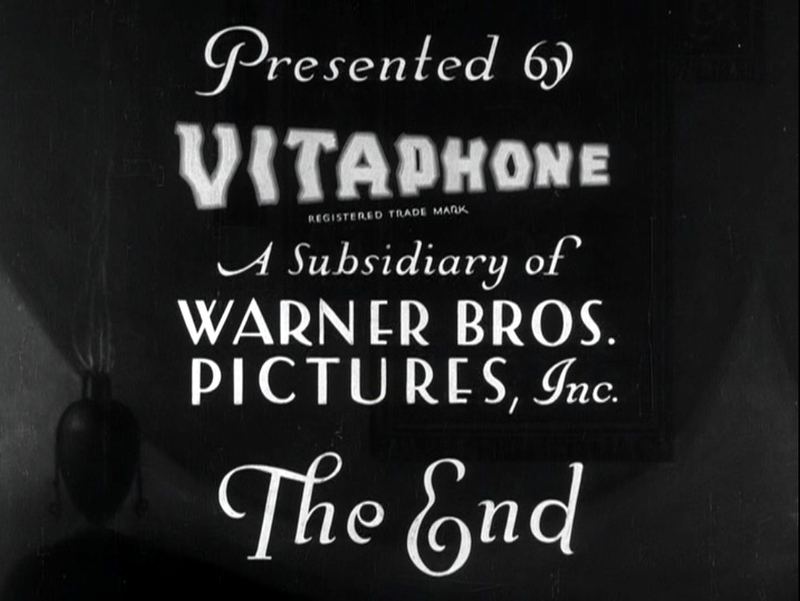 Vitaphone’s brief triumph ended quickly once optical soundtrack technology became standard. Suddenly obsolete, the surviving Vitaphone audio discs were often misplaced or separated from their films. In 1991 a group of record collectors and film archivists led by Ron Hutchinson founded The Vitaphone Project, dedicated to reuniting orphan Vitaphone discs with their mute films, and restoring them on new 35mm sound-on-film prints for modern projection. Nearly 150 short films and many features have since been restored; two recent triumphs include flapper star Colleen Moore’s Synthetic Sin (1929) and Why Be Good? (1929), both once thought to be lost. These charming, quirky, and sometimes downright strange Vitaphone entertainment shorts have become crowd favorites at classic film festivals. 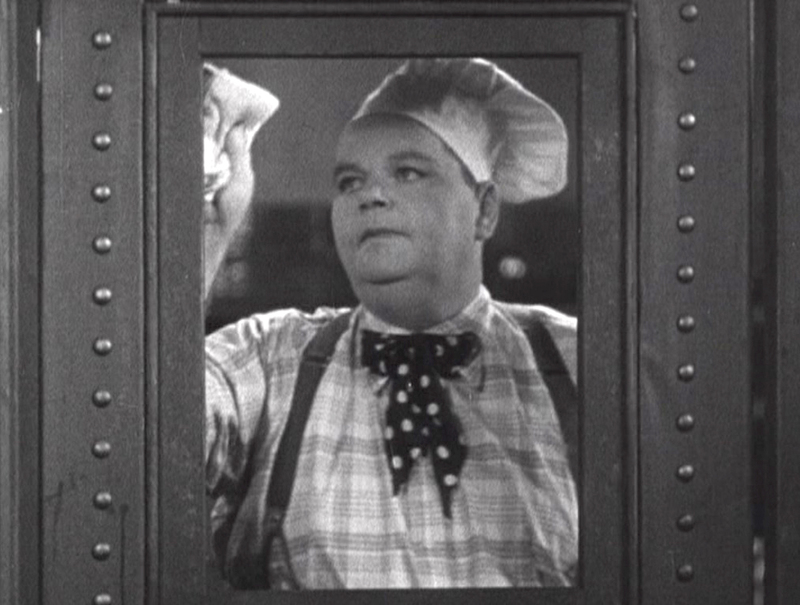 When Ron hosted a full evening of Vitaphone shorts recently on TCM, it reminded me to pull out my Vitaphone Comedy Collection: Volume One DVD, which captivated me with the dozens of street scenes depicted on film. Though the studio building itself is now demolished, the films it once produced continue to preserve priceless moments of everyday Brooklyn life from more than 85 years ago. 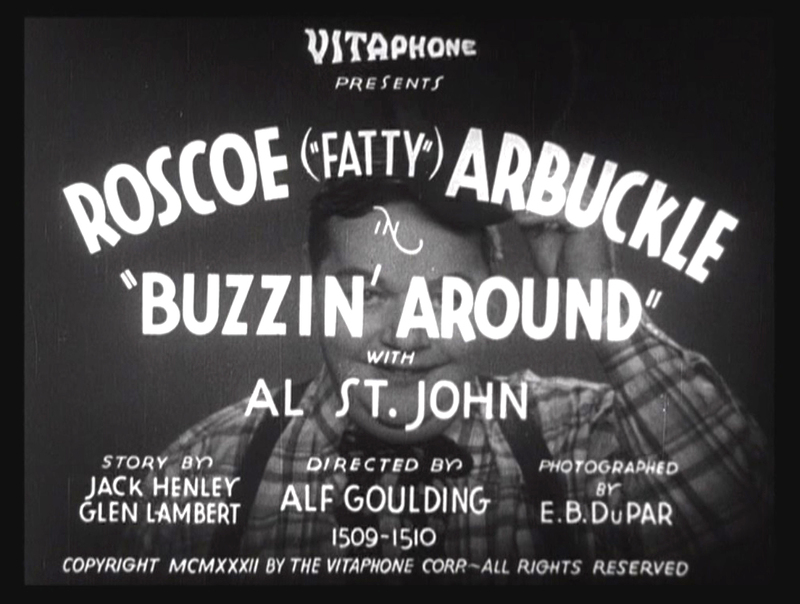 The two films analyzed in this post, Hey Pop (1932) and Buzzin’ Around (1932), were both starring vehicles for pioneering film comedian Roscoe “Fatty” Arbuckle. Arbuckle began his long career in 1913, with Mabel Normand and Charlie Chaplin among his early co-stars. By 1917 Arbuckle led a series of comedy shorts co-starring Al St. John (his nephew) and Roscoe’s protégé Buster Keaton. When Arbuckle began making a series of feature comedies for Paramount in 1920, earning him millions, Buster took over his small production company, launching Keaton’s solo career. Arbuckle is remembered mostly today for his involvement with the death of actress Virginia Rappe following a booze-filled Labor Day weekend party he hosted at the St. Francis Hotel in San Francisco in 1921. Charged with manslaughter, after two mistrials Arbuckle was fully acquitted, receiving a rare public apology from the jury for his ordeal. Despite this, the scandal became a lightning rod for pious America’s backlash against “loose” Hollywood morals, ending his onscreen career. With the help of Buster and others, Roscoe spent the next decade writing and directing, often under the pseudonym “William Goodrich,” while also touring in live shows. Roscoe never lost his public appeal. 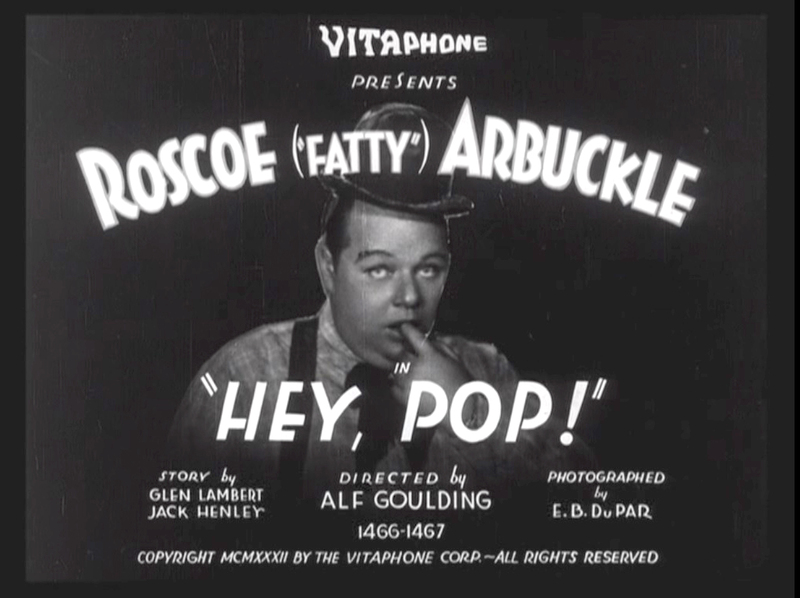 By 1932 Warner Bros. correctly decided audiences would welcome his return to the screen, signing Arbuckle to shoot six two-reel comedies at the Vitaphone Studio in Brooklyn, two of which are studied here. In a tragic confluence of events, on June 29, 1933, his first-year wedding anniversary with actress Addie McPhail, and the day after completing the sixth short, Roscoe signed a long-term contract with Warners sealing his comeback, only to die that evening of a heart attack in his sleep. He was 46. Roscoe used nearly every available corner and apartment. I can’t think of any Hollywood production so densely situated. (C) 2017 Google. Page 2 covers (1), (2), (3), (4), and (12) above. Page 3 covers (5), (6), (7), and (8), Page 4 covers (9), (10), (11), and (15). Page 5 covers (13), (14), (16), (17), (18), and (19). 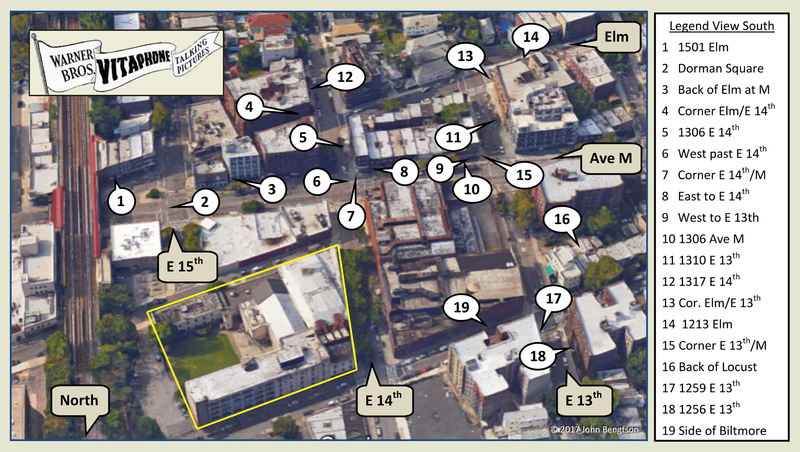 Page 6 covers Ave M between E 18th and E 19th. 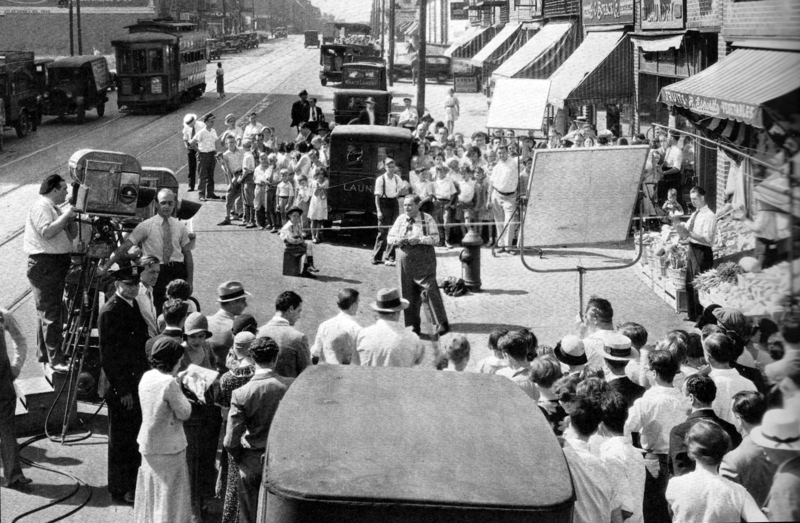 Page 7 covers Bay Ridge and Shemp Howard filming at (8) and (9). This entry was posted in Brooklyn, New York, Roscoe Arbuckle and tagged Al St. John, Avenue M, Brooklyn, Brooklyn movie history, Brooklyn movie locations, Buzzin' Around, E 14th, E 15th, Fatty Arbuckle, Hey Pop, Jack Haley, Midwood, Roscoe Arbuckle, Salt Water Daffy, Shemp Howard, Silent Comedians, Silent Movie Locations, then and now, Vitagraph Studio, Vitaphone, Vitaphone Studio. Bookmark the permalink. Thanks, John! Great as always. John, your remarkable eye works equally well on both coasts! I really enjoyed this post, because I’m a native New Yorker and I own the Arbuckle-Shemp Howard DVD. I’m not from Brooklyn, though (Manhattan), so I was stumped trying to figure out just where these films were made. Brooklyn or Queens, obviously, but just WHERE? Now I know. Thanks! Poor Roscoe, though… he still “had it,” but cruel fate cut him down. Thank you Tom – Roscoe’s life story, the rise, the fall, the comeback, the tragic death, are nearly beyond belief. Why is it “beyond belief”? People die of heart attacks all the time, especially if they are overweight and heavy smokers. Yes, it’s sad, he was plainly a very nice man. But entirely within the realm of believability. There’s no way the Travalanche readers won’t LOVE this article and the blog it comes from. Thanks John Bengtson! Loved this information. Late 50’s early 60’s I lived one block south of Wilshire on Detroit in a building I can see! It has since been torn down and is a parking lot. So many familiar landmarks where movies and history were made. Whoops. Looking through so many areas, lost track and posted to wrong spot.